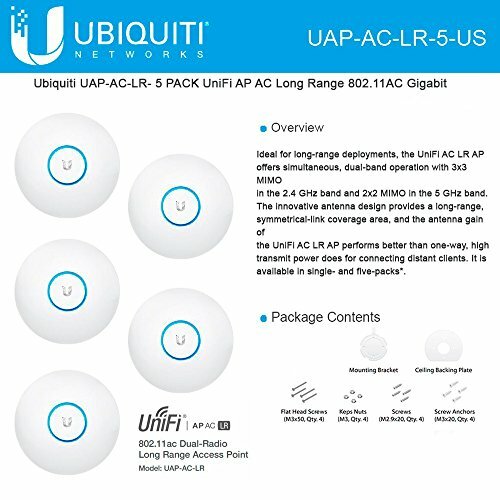 ubiquiti unifi ac long range scalable enterprise wifi system with revolutionary software controller. The unifi enterprise wifi system is a scalable enterprise access point solution designed to be easily deployed and managed. The access point has a sleek design and can be easily mounted to a ceiling tile or wall using the included mounting hardware. It is powered using the included power over ethernet adapter so that you can provide power and data using a single cable. . Ubiquiti unifi ac long range provides 50% further range than base unifi ac model. . The unifi enterprise wifi system includes the unifi controller software. The software installs on any pc within the network and is easily accessible through any standard web browser. Using the unifi controller software, an enterprise wifi network can be instantly configured and administered without any special training. Real-time status, automatic unifi device detection, map loading, and advanced security options are all seamlessly integrated.